Looks like I haven't been writing much on my blog recently. Today I mostly write stuff on Twitter, and have less time for full fledged articles. Maybe when I have some time I'll try to replace the blog with a small website presenting my games. Getting Rid of Flash ? The h3d part is a generalistic low level 3D engine that wraps and abstract the Flash Stage3D API. It also nows integrate well with HxSL shader engine v2 http://github.com/ncannasse/hxsl and have a scene graph that makes it easy to manipulate 3D objects, with support for the popular FBX file format with Skinned meshes animation support. Here's a quick example that shows the result (model is made by Shiro Games for our upcoming game Evoland). 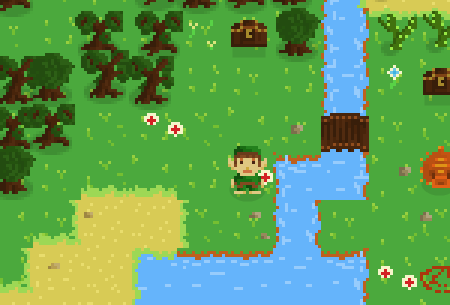 But more often you want also to use the same engine to display 2D sprites so I have added the h2d package that provides a full scene with 2D objects : Bitmaps, but also Tile groups, Text, etc. After years of development, Haxe finally have its dedicated Foundation ! I think that given Haxe increasing success over the past years it should have been done before, but I was lacking the time and focus for it. After leaving Motion-Twin to create Shiro Games it was necessary to make it clear for our users that Haxe is here to stay, and will be supported in the long term. The Haxe Foundation is now the main point of contact for companies that want to adopt Haxe and have questions about it. We are also offering Paid Support Plans and sponsoring various Haxe-related open source projects. Long live to Haxe, long live to the Haxe Foundation ! On Sunday night when I went bed at 4am, tired but satisfied by the game I built in 48 hours for the 24th Ludum Dare, i was not expecting that the next day it will be such a success. First thing I learnt this morning was that DropBox was limiting the amount of traffic you can have on your Public links, and that it has then blocked the game. I was quite surprised since it didn't happen before with my previous games. A few months ago I announced that I was leaving Motion-Twin. We will be making games. Great games. And we have big dreams for the present and future (one of them is to move the company office into an actual castle - since Shiro means both castle and white in japanese). Oh ! And most important : we are RECRUITING ! If you want to join our team and work on the (hopefully) next big thing ™, don't hesitate to contact us ! Haxe 2.10 has been released ! It's one of the best release so far : two new targets (Java and C#) at once, and many cool features, languages improvements and fixes ! As announced on the Haxe mailing list, after more than 10 years I'll be leaving Motion-Twin in a few months. This will not affect in any aspect my personal investment in Haxe or any part of the project, since most of the time spent in compiler development was already made on my spare/hobby time. I will also make sure that any future work that I do after that is mostly done in Haxe, since I don't feel much like writing in another language anymore. In order to have something very clean for Haxe perceptions for companies, I'll make sure that we create soon a Haxe Foundation (NonProfit) that will hold the rights on the code, trademark, host the website etc. Any help is welcome. Time for new adventures !